People have been hanging picture frames since they were invented. They are a wonderful way to showcase your favorite photos. However, sometimes those picture frames can be boring. They are just sitting on a mantel, shelf or end table. They take up valuable space which could be used for other items which is why people began hanging their photo frames on the wall. Today, we present you with an idea that is both unique and creative… Ledge gallery walls. 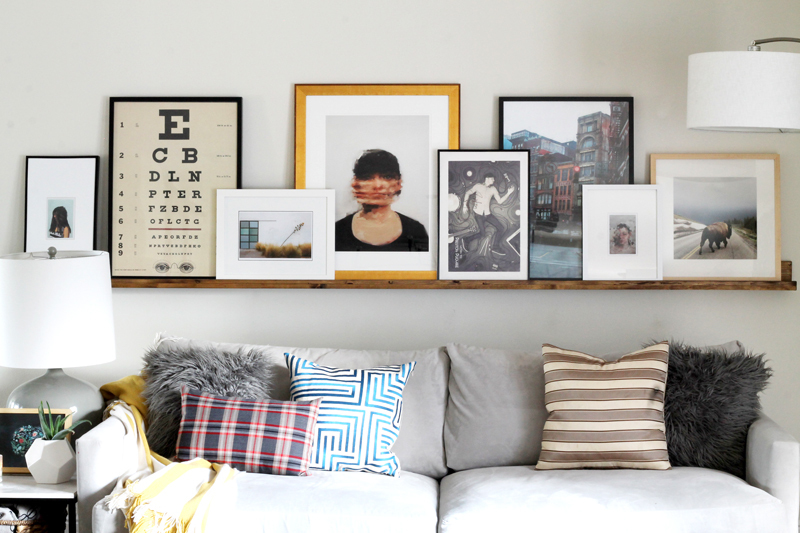 Now, you may be wondering what a ledge gallery wall is. Well, think of it this way, it’s a shallow ledge or a regular floating shelf that is hung on the wall. It holds your favorite picture frames and or trinkets. The wonderful thing about a ledge gallery wall is the endless customizable options. Pair lovely wooden floating shelves with white frames for a clean cut rustic look. You can add wooden cut out letters or even decorative wall decals between the shelves and frames to create a truly three dimensional look. It is sure to please the eye and impress your guests. As if the previous perks weren’t enough, have we mentioned how inexpensive it can be to create a ledge gallery wall? Seriously, we have seen ones that cost anywhere from $5 to $50. It’s all up to you and your budget. Many people who have ledge gallery walls in their home have said their shelves were actually made by themselves. With just a small amount of time and effort. You don’t have to have an endless supply of artistic ability or creativity. You just need the desire to try something new and to showcase your prized photos. We mentioned before about adding other elements to your ledge to help give the wall a multi-dimensional look. These things can be anything from wooden letters that spell a child’s name to seashells you brought home from the last family vacation. You can also paint your shelves to match or accent your current room color scheme. While we are talking about current walls, let’s talk a little about where you can add these beautiful ledge gallery wall designs. Do you have a long hallway? A space in the kitchen above your cabinets that is empty? Could use a little color and sass? The wonderful thing about the ledge gallery wall is you can make your shelves as big or as small as you need. If you want shorter shelves to fit on that drab wall in the bathroom that just isn’t quite big enough to anything you can do that. 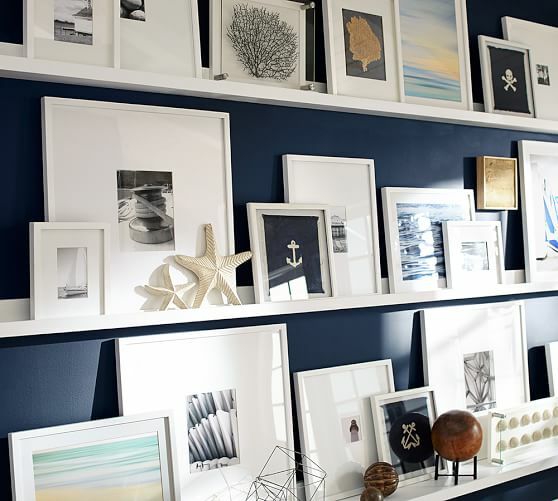 Let your imagination run and your creativity pair with your style sense to create a lovely ledge gallery wall. 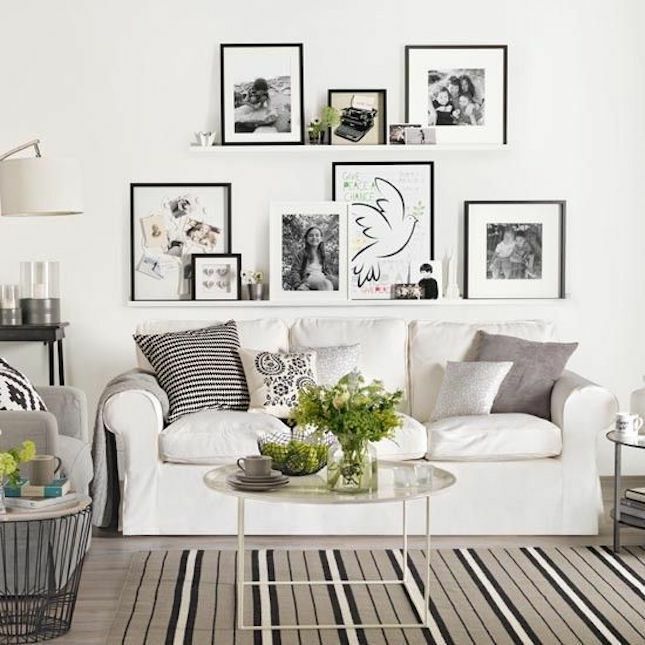 It will not only be a wonderful addition to your room, but will give you a place to showcase your favorite photos without taking up space elsewhere. To keep updated on all of our blogs and the best ideas or tips for your home, we invite you to follow us on Facebook or Twitter.